An animal symbolic of power and courage, such as the lion, can make for a masterful and intriguing painting, as shown in works by world-famous artists such as Peter Paul Rubens and Michael Durst. 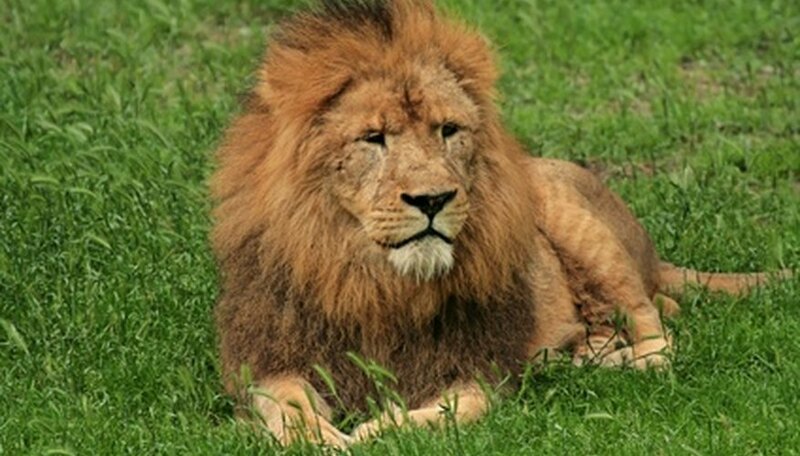 The lion is a carnivorous mammal classified in the family Felidae, the biological family of cats, and you can depict a lion in a painting of your own with basic art supplies and by including the most recognized features of the animal, including a thick mane and long, slender tail. Sketch the outline of the lion onto a piece of art paper or canvas. Draw an oblong shape for the head of the lion, and one rounded ear on each side at the top of the head. Make a thick squiggly line around the entire head of the lion to create the mane, along with a large body and four wide legs and paws, as well as a long, slender tail with a tip of hair on the end, if you want to include the entire body of the lion. Finish the outline by adding in the details to the lion's face -- two small rounded eyes, a triangular-shaped nose and a sort of "W" shape for the mouth, with the center line adjoining to the bottom of the nose. Pour equal amounts of light brown, dark brown, gold and black acrylic paint onto a painter's palette. Dip a paintbrush into the light brown paint, allow any excess paint to drip off and paint over the face and body of the lion, leaving only the eyes, nose, mouth and mane sections bare. Dip a paintbrush into the dark brown paint, allow any excess paint to drip off and paint in the mane. Wait for the paint to dry completely. Dip a paintbrush into the gold paint, allow any excess paint to drip off and lightly tap the brush across the mane and body of the lion, focusing on the top areas to create highlighting. Dip a paintbrush into the black paint and paint over the eyes, nose and mouth. Add a few thin straight lines coming from underneath the lion's nose to create whiskers. Add strokes of green paint under the lion to create the look of grass in your painting. You can dab over the paint as you color with a dry sponge to help blend the different paint colors.